David is an accomplished musician and professional storyteller. he has published several novels relating to Jamaican Folklore and Witchcraft. 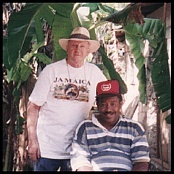 In this photo he is with friend Spoogy on location in Jamaica. Spoogy provides authentic background information to his stories. David is married to Leonie, his Jamaican Wife. Until recently he was EW Group Secretary. A reading by David is often peppered with his own unique brand of humour and never fails to bring his audience into the tale. He is a member of The Storytellers of Nottingham. His own website is: www.duppyman.co.uk.